Futures market volatility: What has changed? (Nicolas P.B. Bollen), Journal of Futures Markets, forthcoming. Trading volatility: At what cost? Journal of Portfolio Management 40 (Fall 2013), 95-108. Using option prices to infer overpayments and synergies in M&A transactions (with K. Barraclough, D.T. Robinson, and T. Smith), Review of Financial Studies 26 (2013), 695-722. Put option exercise and short stock interest arbitrage (with K. Barraclough), Journal of Investment Management 11 (2013), 66-81. Early exercise of put options on stocks (with K. Barraclough), Journal of Finance 67 (August 2012), 1423-1456. No-arbitrage price relations: Options, The Encyclopedia of Financial Models, Volume I (2012), Frank Fabozzi (Editor), Hoboken, New Jersey: John Wiley & Sons, Inc., 437-456. No-arbitrage price relations: Forwards, futures, swaps, Encyclopedia of Financial Models, Volume I (2012), Frank Fabozzi (Editor), Hoboken, New Jersey: John Wiley & Sons, Inc., 421-436. Stock option contract adjustments: The case of special dividends (with K. Barraclough and H.R. Stoll), Journal of Financial Markets 15 (May 2012), 233-257. Trading relative performance with Alpha Indexes (with J.S. Sagi), Financial Analysts Journal 67 (November/December 2011), 77-93. Commodity index investing: Speculation or diversification? (with H.R. Stoll), Journal of Alternative Investments 14 (Summer 2011), 50-60. Commodity index investing and commodity futures prices (with H.R. Stoll), Journal of Applied Finance (2010), 1-40. Common divisors, payout persistence, and return predictability (with J.G. Powell, J. Shi, and T. Smith). International Review of Finance 9 (December 2009), 335-357 (Lead article). Political regimes, business cycles, seasonalities, and returns (with J.G. Powell, J. Shi, and T. Smith). Journal of Banking and Finance 33(2009), 1112-1228. Understanding VIX, Journal of Portfolio Management 35 (Spring 2009), 98-105. Hedge fund risk dynamics: Implications for performance appraisal (with N.P.B. Bollen), Journal of Finance 64 (April 2009), 985-1035. Elementary statistics, Handbook in Finance, Volume III, Valuation, Financial Modeling, and Quantitative Tools, Frank Fabozzi (Editor), Hoboken, New Jersey: John Wiley & Sons, Inc. 2008, Chapter 58, 645-667. Regulation fair disclosure and the cost of adverse selection (with B. Sidhu, T. Smith and R. Willis), Journal of Accounting Research 46 (June 2008), 697-728. Volatility derivatives, Handbook in Finance, Volume I, Financial Markets and Instruments, Frank Fabozzi (Editor), Hoboken, New Jersey: John Wiley & Sons, Inc. 2008, Chapter 16, 191-203. Failure to Exercise Call Options: An Anomaly and a Trading Game (with V. Krepley and H.R. Stoll), Journal of Financial Markets 11 (2008), 1-35 (Lead article). The persistent presidential dummy (with J.G. Powell, J. Shi, and T. Smith), Journal of Portfolio Management 33 (Winter 2007), 133-143. Ownership, competition, and financial disclosure (with J.L. Birt, C.M. Bilson, and T. Smith), Australian Journal of Management 31 (December 2006), 235-264. Modeling the bid/ask spread: Measuring the inventory-holding premium (with N.P.B. Bollen and T. Smith), Journal of Financial Economics 72 (April 2004), 97-141. Does net buying pressure affect the shape of implied volatility functions? (with N.P.B. Bollen), Journal of Finance 59 (April 2004), 711-754. Optimal contract design: For whom? (with N.P.B. Bollen and T. Smith), Journal of Futures Markets 23 (August 2003), 719-750. Stock splits: Implications for investor trading costs (with S. Gray and T. Smith), Journal of Empirical Finance 10 (May 2003), 271-303. Derivatives. In Handbook of the Economics of Finance: Volume 1B Financial Markets and Asset Pricing, George Constantinides, Milton Harris, and Rene Stulz (Editors), Elsevier North-Holland Publishing, 2003, 1129-1206. On the return and risk of the CBOE BuyWrite monthly index, Journal of Derivatives 10 (Winter 2002), 35-42. S&P 500 index replacements: A new game in town (with M.D. Beneish), Journal of Portfolio Management 28 (Fall 2002), 51-60. The investor fear gauge, Journal of Portfolio Management 26 (2000), 12-17. Reset put options: Valuation, risk characteristics, and an application (with S. Gray), Australian Journal of Management 24 (June 1999), 1-20. Simulating supply (with N.P.B. Bollen), RISK 26 (September 1998), 143-147. Also in Corporate Hedging in Theory and Practice: Lessons from Metallgesellschaft, C.L. Culp and M.H. Miller (Editors), RISK Books, London, England, 1999. Are ‘Teenies’ better? (with N.P.B. Bollen), Journal of Portfolio Management 25 (Fall 1998), 10-24. Implied volatility functions: Empirical tests (with B. Dumas and J. Fleming), Journal Finance 53 (December 1998), 2059-2106. Also in The International Library of Critical Readings in Financial Economics: Options Markets, G.M. Constantinides and A.G. Malliaris (Editors), Edward Elgar Publishing Limited, 2000. Building on Black-Scholes, RISK 25 (December 1997), 149-156. Also in Hedging with Trees: Advances in Pricing and Risk Managing Derivatives, M. Broadie and P. Glasserman (Editors), RISK Books, London, England, 1998. Valuing S&P 500 bear market warrants with periodic resets (with S. Gray), Journal of Derivatives 4 (Fall 1997), 99-106. Expiration-day effects of the All Ordinaries Share Price index futures: Empirical evidence and alternative settlement procedures (with H.R. Stoll), Australian Journal of Management 22 (December 1997), 139-174. Assessing goodness-of-fit of asset pricing models: The distribution of the maximal R-squared (with F.D. Foster and T. Smith), Journal of Finance (June 1997), 591-607. A scorecard from the ‘S&P Game’ (with M.D. Beneish), Journal of Portfolio Management (Winter 1997), 16-23. An anatomy of the ‘S&P Game’: The effects of changing the rules (with M.D. Beneish), Journal of Finance (December 1996), 1909-1930. Valuing spread options, Energy in the News (Summer 1996), 42-45. Trading costs and the relative rates of price discovery in the stock, futures and options market (with J. Fleming and B. Ostdiek), Journal of Futures Markets 16 (June 1996), 353-387. Predicting stock market volatility: A new measure (with J. Fleming and B. Ostdiek), Journal of Futures Markets 15 (May 1995), 265-302. Also in the Chicago Board of Trade’s Research Symposium Proceedings, December 1994, 155-200. Mean reversion of S&P 500 index basis changes: Arbitrage-Induced or Statistical Illusion? (with M.H. Miller and J. Muthuswamy), Journal of Finance 49 (June 1994), 479-513. Estimating the effective bid/ask spread using time and sales data (with T. Smith), Journal of Futures Markets 14 (June 1994), 437-455. Assessing the costs of regulation: The case of dual trading (with T. Smith), Journal of Law and Economics 37 (April 1994), 215-246. The value of wildcard options (with J. Fleming), Journal of Finance 49 (March 1994), 215-236. Predictability of stock index basis changes, Review of Futures Markets 12 (1993), 503-508. Intraday price observations: On computing portfolio returns, Review of Futures Markets 12 (1993), 175-190. Derivatives on market volatility: Hedging tools long overdue, Journal of Derivatives 1 (Fall 1993), 71-84. Also in Volatility: New Techniques for Pricing Derivatives and Managing Financial Portfolios, R.A. Jarrow (Editor), RISK Books, London, England, 1998. One market? Stocks, futures and options during October 1987 (with A. Kleidon), Journal of Finance 47 (July 1992), 851-877. Market volatility prediction and the efficiency of the S&P 100 index option market (with C.R. Harvey), Journal of Financial Economics 30 (February 1992), 33-73. Dividends and S&P 100 index option valuation (with C.R. Harvey), Journal of Futures Markets 12 (April 1992), 123-137. S&P 100 index option volatility (with C.R. Harvey), Journal of Finance 46 (September 1991), 1551-1561. Expiration-day effects: What has changed? (with H.R. Stoll), Financial Analysts Journal 47 (January/February 1991), 58-72. The dynamics of stock index and stock index futures returns (with H.R. Stoll), Journal of Financial and Quantitative Analysis 25 (December 1990), 441-468. Also in Futures Markets, A.G. Malliaris (Editor), Edward Elgar Publishing Limited, Cheltenham, United Kingdom, 1995. Stock market structure and volatility (with H.R. Stoll), Review of Financial Studies 3 (Spring 1990), 37-71. Intraday price change and trading volume relations in the stock and stock option markets (with J. Stephan), Journal of Finance 45 (March 1990), 191-220. Program trading and individual stock returns: Ingredients of the triple witching brew (with H.R. Stoll), Journal of Business 63 (January 1990), S165-S192. Futures and options on stock indexes: Economic purpose, arbitrage, and market structure (with H.R. Stoll), Review of Futures Markets 7 (1988), 224-248. On the valuation of American put options on dividend-paying stocks (with G. Barone-Adesi), Advances in Futures and Options Research 3 (1988), 1-13. Stock index futures and options: Economic impact and policy issues (with H.R. Stoll), International Journal of Securities Markets 2 (1988), 3-19. Program trading and the Monday massacre (with H.R. Stoll), Investment Management Review 2 (January/February 1988), 27-34. Stock market volatility and index futures: Message versus messenger (with H.R. Stoll), Journal of Portfolio Management 14 (Winter 1988), 20-22. Efficient analytic approximation of American option values (with G. Barone-Adesi), Journal of Finance 42 (June 1987), 301-320. Also in Selected Writings on Futures Markets: The Interrelations Between Futures, Option and Futures Option Markets, R.E. Whaley (Editor), The Chicago Board of Trade, Chicago, IL, 1992, in Currency Derivatives: Pricing Theory, Exotic Options, and Hedging Applications, D. DeRosa (Editor), John Wiley and Sons (1998), and in The International Library of Critical Readings in Financial Economics: Options Markets, G.M. Constantinides and A.G. Malliaris (Editors), Edward Elgar Publishing Limited, 2000. Program trading and expiration day effects (with H.R. Stoll), Financial Analysts Journal 43 (March/April 1987), 16-28. Also in CRSP Proceedings, The Seminar on Research in Security Prices (February 1987), 139-163, and CFA Readings in Derivative Securities, M.A. Berry and K.F. Sherrerd (Editors), The Institute for Chartered Financial Analysts (1988), 205-216. Winner of 1987 Graham and Dodd Scroll for Excellence in Financial Writing. Program trading and the stock market (with H.R. Stoll), Financial Analysts Journal 42 (November/December 1986), 8. Expiration day effects of index futures and options–Empirical tests, Review of Research in Futures Markets 5 (November 1986), 292-304. The valuation of American call options and the expected ex-dividend stock price decline (with G. Barone-Adesi), Journal of Financial Economics 17 (September 1986), 91-111. Abstract appears in Journal of Economic Literature 25 (June 1987), 1150. 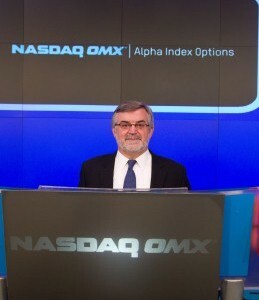 New option instruments: Arbitrageable linkages and valuation (with H.R. Stoll), Advances in Futures and Options Research 1(A) (1986), 25-62. On valuing American futures options, Financial Analysts Journal 42 (May/June 1986), 49-59. Also in CFA Readings in Derivative Securities, M.A. Berry and K.F. 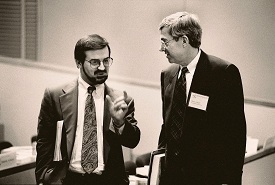 Sherrerd (Editors), The Institute for Chartered Financial Analysts (1988), 194-204. Winner of 1986 Graham and Dodd Scroll for Excellence in Financial Writing. Valuation of American futures options: Theory and empirical tests, Journal of Finance 41 (March 1986), 127-150. Also in The Handbook of Financial Engineering: New Financial Product Innovations, Applications, and Analyses, C.W. Smith Jr. and C.W. Smithson (Editors), Harper Business, A Division of Harper & Row, Publishers, New York, 1990; in The Financial Derivatives Reader, R.W. Kolb (Editor), Kolb Publishing Company, Miami, FL, 1992; and in Selected Writings on Futures Markets: The Interrelations Between Futures, Option and Futures Option Markets, R.E. Whaley (Editor), The Chicago Board of Trade, Chicago, IL, 1992. Abstract appears in Journal of Economic Literature 24 (September 1986), 1606. The new options markets (with H.R. Stoll) in Futures Markets: Their Economic Role, A. Peck (editor), Washington, D.C.: American Enterprise Institute (1985), 205-289. New options instruments: Arbitrageable linkages and valuation: An extended abstract (with H.R. Stoll), Proceedings of the Money, Banking and Insurance Symposium (December 1984), 1067-1076. Equity futures contracts: A new stock portfolio management tool, Advantage 6 (April 1984), 119-120. Transaction costs and the small firm effect (with H.R. Stoll), Journal of Financial Economics 12 (June 1983), 57-79.
and Economics 4 (October 1982), 57-83. 29-58. Also in Empirical Research in Capital Markets, G.W. Schwert and C.W. Smith Jr. (Editors), McGraw-Hill Book Company (1991). On the valuation of American call options on stocks with known dividends, Journal of Financial Economics 9 (June 1981), 207-211. 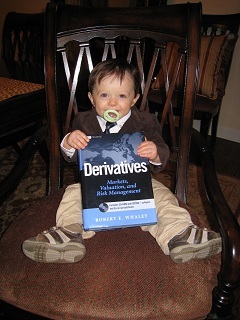 Also in CFA Readings in Derivative Securities, M.A. Berry and K.F. Sherrerd (Editors), The Institute for Chartered Financial Analysts (1988), 127-131; and in Selected Writings on Futures Markets: The Interrelations Between Futures, Option and Futures Option Markets, R.E. Whaley (Editor), The Chicago Board of Trade, Chicago, IL, 1992. Transaction costs on government bonds: Are-specification (with D. Grant), Journal of Business 51 (January 1978), 57-64. To obtain legal copies, please visit the Social Science Research Network (SSRN).